Our company is capable of delivering consignments on time owing to an efficient trading network we have. With the assistance of our packaging experts and advanced machines, we became capable of meeting the standard as well as customized packaging requirements of the clients. Details : Pemnat contains pemetrexed and belongs to a class of medications called antifolate antineoplastic agents. 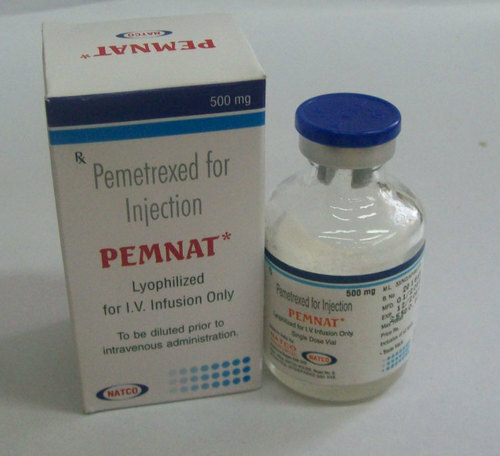 Indication : Pemnat may also be used for the treatment of non-small cell lung cancer.Pemnat is used with for the treatment of malignant pleural mesothelioma (a type of cancer that affects the inside lining of the chest cavity) who cannot be treated with surgery.